Although by far, this is not a scientific experiment, it is however designed to show some of my fellow palm and tropical gardening enthusiast & friends, the results I obtained using Aspergillus in the seed germination process. 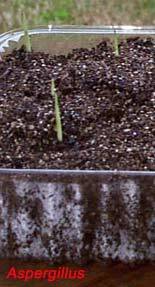 As many of us already know, germinating certain seed, especially those in the Palmae family, can take many months and even years in some cases for the radicle and first plumule to form. In this test, I'm attempting to analyze and document the progress, as to the length of time it takes, plus the quantity of seed in each case that do germinate of the species, Chamaedorea radicalis, using seed treated with Aspergillus and a Control set with out the seed being treated. 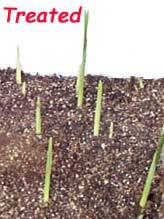 And finely by checking the root system for any unusual growth, by comparing both the treated and untreated plants. 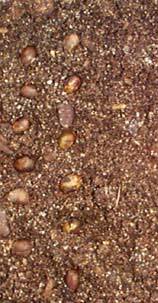 Bottom line: To determine if Aspergillus aids and enhances seed germination and plant development. I used a plastic covered tray 6 1/2 inches by 5 inches and filled with sterilized seed starting mix. 12 Chamaedorea radicalis seeds were put into a baggy with a teaspoon of Aspergillus inoculate and agitated until all seed were completely covered with substance, these were than planted in the potting mix. 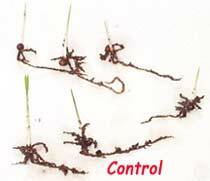 12 Chamaedorea radicalis seed were used as a control. Trays were watered and placed in a warm but dark area. No bottom heat was used and I only watered once, about 20 days into the experiment. Trays are inspected at least once a week. Note: All seed used in this experiment are fresh and were harvested October 2000. 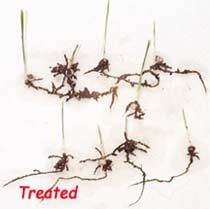 No fertilizer or plant stimulants were used whatsoever including EcoSane, HB-101, B1 or other plant hormones. We have all tried the baggy method or in the pot, (they either grow or else they rot) method, with some and some not-so successful results. Bottom heat is usually recommended and it certainly wouldn't hurt in speeding up seed germination. But usually we fall short of our expectations, our special palm seed, that we dreamed someday towering over head, for all the world to see, doesn't happen like we planed. Sometimes we forget to water and as time goes by we seem to forget about what we did back 6 months ago and when we do remember we find a disappointing dried pot or dry moldy seed left in our long forgotten baggy. We must try and check each and everyday our seed, in order to accomplish our mission. Chamaedorea radicalis seed, half of which have been treated with Aspergillus the other half are left untreated. These seeds were planted on a seed starting mix, November 19, 2000. Please note that no bottom heat was used in the germination process. Covered seed trays were kept in a warm room without sunlight. 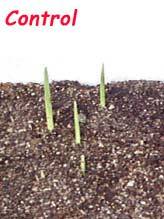 Chamaedorea radicalis seed started to germinate January 3, 2001, notice as we begin to compared the untreated seed to that of the Aspergillus treated seed, the germination ratio for the latter is 4 to 1. 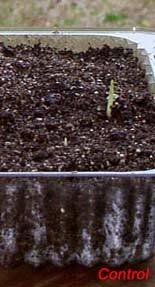 Note: 45 days from time of planting to when first noticed that seed sprouted. Image taken January 27, 2001. Showing treated set with 9 sprouted seed (Fig5 left) whereas the control set (Fig6 right) only has 5 sprouted seed. 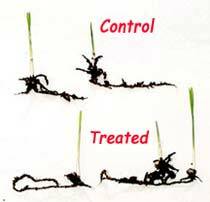 After 70 days from sowing seed, this experiment shows early on, that the seed treated with Aspergillus, did indeed germinate sooner than the control set. From January 3rd to the 25th the ratio was 8 treated to 3 untreated. As time continues from January 27th to the 29th, this shows an increase of untreated seed at a ratio of 3 untreated to 1 treated. 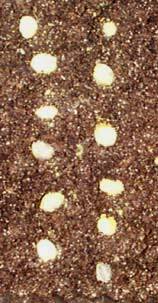 Although the untreated seed is now germinating at an increased rate, this however, still demonstrates, that the seed treated with Aspergillus did in fact germinate sooner, not only that, but the new growth shown in the latest set of images (Fig5-Fig6), is already beyond the first plumule stage, as the eophyll (first leaf) is about to emerge on two of the treated seedlings, whereas it is not present on the control set. After a 80 days, a total of 15 seed germinated out of 24. The control set managed to produce 6 seedlings (Fig6) while the Aspergillus set produced 9 seedlings (Fig5). By comparing the two sets of seedlings (Fig7, Fig8, and Fig9) there seems to be no noticeable difference between the two sets, both treated and control or untreated seed. So my conclusion is, that out of the 12 seeds from each set, 3/4 sprouted or a total of 9 seed in the treated set, while only 1/2 or a total of 6 seed sprouted in the control set. Net ratio 3 to 2 for the treated seed. to lose those winter time Blues!